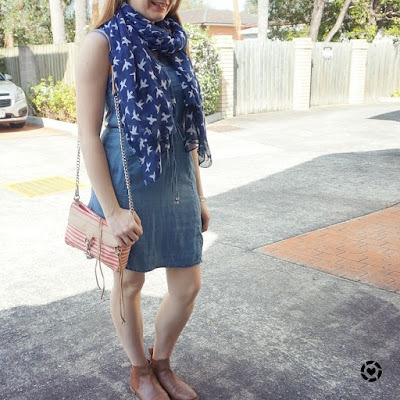 While the weather is warming up as summer is arriving soon here in Brisbane, I took advantage of a few cooler days to wear a much loved spring outfit formula: dresses and ankle boots. I added some cute scarves for an extra touch of colour too! It's not the first time I've worn mustard yellow with this dress and definitely won't be the last - I really like the combination! A nice and simple outfit with the black printed dress, ankle boots and matching mustard accessories for a quiet day with the boys. We ran a few errands. I picked up my Christmas dress at Jeanswest (as the first store I went to didn't have my size!) and grabbed some groceries after spending some time at the library. Nice relaxing day. As we weren't in a rush to be anywhere that morning and could set our own pace for the day, I decided to try snap another twirl pic with this dress. It twirls so beautifully, it's just not easy to capture on camera! I was pleased with the shot I got. Last worn: mustard scarf, tiered printed dress, black ankle boots, Rebecca Minkoff micro Regan. Other ways to wear: mustard scarf and olive pants, tiered printed dress and kimono, black ankle boots worn 30 ways, Rebecca Minkoff micro Regan and maxi skirt. Comparing the two handbags I'm wearing in this post side by side in under 4 minutes. Making use of the easy, comfortable outfit formula and wearing a dress and ankle boots again for another quiet day with the boys. I really treasure the SAHM days I get when working part time. On this day, despite the warm sunny weather, we spent the day inside at the library for music time, and then running a couple of errands before heading home. I did kinda wish we'd spent the day outside instead when the rain set it in for the rest of the week, and we were forced to stay indoors, ha! I was sure that I'd worn this bird print scarf and the chambray dress together before, I was quite surprised to find that I hadn't when I searched through the blog. With the blue dress and scarf together and neutral tan ankle boots, I thought the red striped mini MAC bag waas a cute touch of colour. And a little bit of print mixing. Last worn: bird print scarf, chambray dress, Chelsea ankle boots, Rebecca Minkoff striped mini MAC. Other ways to wear: bird print scarf with stripes, chambray dress in winter, Chelsea ankle boots and jeans, Rebecca Minkoff striped mini MAC and denim shorts. Perfect for pregnancy: chambray dress in second trimester, Chelsea ankle boots in second trimester, Rebecca Minkoff striped mini MAC in third trimester. A simple dress and ankle boots is a quick and easy spring outfit formula, perfect for a busy mum. For a little extra interest to your outfit, you can add a colourful or printed scarf. It helps keep you cosy for the cooler mornings and evenings, and can easily be taken off when the days warm up. Linking up with Fashion Frenzy, Style On The Daily, Thursday Fashion Files, Chic And Stylish, Weekend Wear, Fab Favourites, Fancy Friday, Weekend Link Up. Oh I love that cute little black dress! I can't believe it's from Kmart!! And it looks fantastic paired with the yellow scarf and bag! I adore the yellow with that darker dress...it seems to liven it up so much! And the ankle boots with these make it feel so modern and chic!! Ooh love both of these! The print of that first dress is perfect and I love it with the grey boots! I'm so jealous you're getting warmer weather! Love the yellow scarf over the dress, the colours work perfectly! Such cute looks! I really love all the mustard yellow in the first outfit, Mica - your use of colour in your outfits is always so thoughtful. We are having crazy rainy weather here too. Now it's sunny, but it was pouring this morning! I love how the bags really pop in both outfits! The first dress was made to be paired with mustard! I love the combination! Hope you are having a great week! Ohh I'm liking your spring formula of dresses with ankles and I love the addition of the scarves. Really takes the outfit to the next level! The dress really twirls beautiful. As for the combination: I admire it on others, but on myself I find that ankle boots paired with dresses shorten my legs significantly. I love the black dress paired with the mustard scarf and PURSE. You look adorable and I can relate to dressing for warm weather while the rest of the country looks buried in snow! Hope you have a great week! The bag and scarf look awesome together Mica. I love the pops of yellow! I LOVE the first outfit! The dress is beautiful, but with that scarf? Even better! I didn't think to pair scarves with dresses, I'm gonna do that in summer! Loving that yellow color! You look lovely! I'm loving all that yummy mustard in the first outfit! Gorgeous! That is a very beautiful share of yellow! Lovely outfits as always! Love the mustard/yellow paired with the black, I always worry about pairing those two colors and looking like a 'bumblebee' but it works well! And, that fitted chambray dress is too cute on you! I think keeping it to just yellow accessories helps avoid the bee look, haha! I love both of these outfits, but I really like how the mustard color pops in the first outfit! Ankle boots and dresses are a really great outfit combination. I hope you have a great weekend and enjoy the warm weather! Loving the mustard with the black dress. That awesome that you got your Christmas dress. I have no idea. What I will be wearing for Christmas. Aww, how cute is the twirly picture? I love it. Ankle boots with a dress is such a great combination, and I love both of these pairings so much. The print mix in your second look is so fun too! I adore this mix of yellow and black in the first look! That dress is so chic. Summer oh my, we just had our first snow storm of the season today. 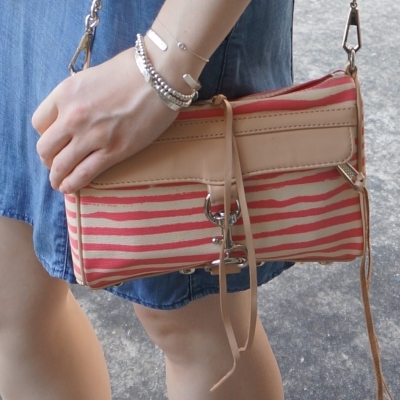 But that aside love these smaller crossbodies I always go a bit smaller in the summer and love crossbody bags for that. Crazy you have snow while we are in a heatwave! You look summer ready Mica. I love that dress and the yellow scarf is perfect with it. It's freezing here now and the atmosphere is saturated with smoke from all the fires burning in California. Hope you have been safe from the fires! There are a lot here too but thankfully far enough away from us and friends and family for the time being. Oh I love the twirl! I think you captured it. That dress is so light and airy and the scarf is just perfect with it! Thanks Ruth, took me a few goes to get it right haha! It's too bad that you didn't have the best weather, but hopefully it clears up soon. Both looks are lovely, but the first one is my favorite. I love the combination of black and yellow (actually shared a look in these colors recently). The dress is so beautiful and the yellow scarf gives it a wonderful pop of color. Love that first outfit and the cute little yellow bag. Really cute. The first dress is so cute and I love the twirl factor! So pretty styled with gold! I love the fact you added a pop color to with your black dress! Your dress looks lovely with your boots. wow, you look sensational in that dress. I love how you paired it with mustard accessories, the scarf and the bag...they really stand out against the darker dress. The second outfit is very chic as well. You look so pretty. I feel like I always miss dress and ankle boot weather - it's terribly short! But these are such cute pairings. Thanks so much for sharing your post with us at Welcome To The Weekend Blog Hop. Have a great weekend and we hope to see you soon. Both are cute looks dear. Love the contrast of the yellow scarf and gold bag from the chic lbd. On one of my recent closet edits i got rid of my ankle boots, they were old and i was done with them. Gave them one last wear with a maxi dress. These two outfits work very well with ankle boots. Love the little mom edginess that these outfits have, definitely because of the flat ankle boots. The first outfit is my favorite one because of all the pops of mustard. I always love black with any yellow. The two scarves pull the dresses together, also. Have a fantastic week ahead! <3 Ada.